Let's Celebrate The Culture Of Writing With SCHMIDT Fountain Pens. 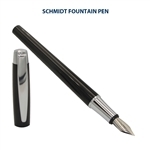 The culture of writing is celebrated by the use of the most prestigious writing instrument, the Fountain Pen. SCHMIDT doesn’t accept any compromise when the quality of our writing instrument is concerned. 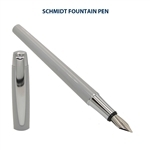 Even though the SCHMIDT Fountain Pens offered below are considered “Entry-Level” pens they include SCHMIDT's reliable stainless-steel nib that deliveries a great writing experience every time it’s used. 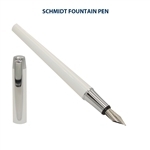 This SCHMIDT Fountain Pen is a classic everyday writer with a lightweight resin body, a comfortable metal grip section, and SCHMIDT's medium size stainless-steel fountain pen nib. The resin body is durable and available in several color, fitted with all-metal threads, and slim enough for users with smaller hands. Features a chrome-plated pocket clip, the cap pulls off and posts to add length and weight while you write. The SCHMIDT Fountain Pen offers a wide array of different writing nibs of different materials and surface treatments.This range is completed by a collection of piston converters and most recently a ready-to-build-in piston fountain pen unit. This is a great first fountain pen for just about anyone-whether it’s a back-to-school gift for a student, or an inexpensive everyday writing to start your own collection.